HJ: The past and the future are illusions. Everything exists in an ever-evolving, ever-shifting present moment and the more you can align your life and awareness with that fact, the better it will get. Imagine if you went about your day experiencing each moment as if you’d chosen it—good or bad, wanted or unwanted, fun or painful. What would happen? How would your life be any different? Let’s keep this thought in mind as we look into what we normally do. We mostly live in anticipation of what we want, or in fear of what we don’t want. We either look forward to something, or want to avoid something at all costs. So we spend the present moment living in the future. Or we go back to the past and reminisce about what was, or wallow in regret. What about the present moment that contains all the thoughts and feelings and experiences? How are we living it? We’re not living it. We’re avoiding it. 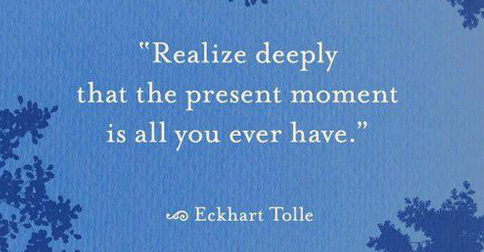 We all know that the present moment is all there is. We think about the past, and the future in the present. We feel what we feel, no matter where or when the feeling originated, in the present moment. In the present we react to the events of the past and think about the possibilities of the future. In these situations our present moment is viewed as an obstacle. If we’re experiencing something we want, we don’t want it to end. And if we’re going through a negative experience, we can’t wait for it to be over. Again we’re wavering between attachment and avoidance. With attachment we hold on to things beyond their intended purpose, and that causes us pain. With avoidance, we reject and resist and that empowers the feelings to stick around even longer causing us more pain. What would happen if we stopped and acted as if we chose this very moment, no matter what the experience is? What would happen if you’d chosen this moment? The moment we shift from unconscious reaction to conscious choice, our entire being shifts. Choice awakens. We become more aware of what we’re experiencing. Instead of reacting on automatic to events and feelings, we’re choosing them—on purpose. Choice empowers. We’re no longer victims of circumstance. We can accept the responsibility for the choice, and do the best we can. Choice neutralizes. Our choice is complete as it is. So we’re able to see both the positives and negatives of each choice, without attachment or rejection. Making a conscious effort to choose the present moment, regardless of what it contains makes a lot of sense—in theory. Putting it into practice can be a challenge because of our habitual conditioned responses. We can look at conscious choice as a habit. Over time, and with practice, we can make small mindful adjustments to our choice of action or reaction. Let’s look at the possibilities of choice in each moment. Life is anything but predictable. We may go on with our days as planned. But there’s always the possibility for an unforeseen interruption. When faced with an unexpected situation, we can stop for a moment, and make a conscious decision to deal with it, as if we’d chosen it. Whether it’s a health challenge, a demanding project at work, or a car breaking down, we can take control of how we deal with the situation—not the situation itself. In these instances, we can say: I made this choice. What are my options? We can then weigh the advantages and disadvantages of each option, and pick the best course of action. We’re responsible for how we handle it, and are willing to take the positive benefits and negative consequences of our decision. One might think I can’t say that I chose to get sick. Why not? We’re dealing with it anyway. Why not act as if it were a choice, instead of an unwanted challenge? When faced with a health issue, we can look into seeing a doctor, changing our diet, or starting an exercise program. The moment we shift to choice, we automatically accept the situation rather than reject it. Reactions by nature appear to be almost instinctive, and out of our conscious control. When it comes to basic survival, this might be true. But in most situations, our reactions are just inherited habitual behaviors. If someone’s cuts me off in traffic, is it necessary to give him/or her a dirty look or gesture aggressively? No, it’s a habit. If I were criticized, do I only have anger to revert to? No, it’s an ego thing. If a loved one doesn’t do what they said they’d do, do I only have one option of nagging them and feeling crappy about it? No, it’s a conditioned response based on wanting control. To start the change, however, we need to go with the reaction as it comes up and make it a choice. Yes I chose to angrily scream at the rude driver who cut me off, react defensively to criticism, and berate a loved one. But because I made those reactions a choice, I can take full responsibility for what happens next—desired or undesired. The reactions may be unpleasant. But turning them into a choice alleviates the pain of resistance, and can empower us to change the unhelpful behavior. Feelings are deeply rooted in emotional memories, and can be hard to detect as they arise. Before we know it we’re feeling whatever it is that we’re feeling. The choice starts when we become aware of how we’re feeling. We can stop and act as if we’d chosen the feeling. Feeling anxious about a big presentation? Once you recognize the sensations, you can say to yourself: At this moment I choose anxiety. And allow yourself to feel whatever comes up. Take it as it comes, and let go of it as it fades away. Use the same approach with sadness, or anger, or any other negative emotion. Make it a choice and follow the physical sensations. The same can also be said about positive feelings, which we want to hold on to beyond their lifespan. When we make a positive feeling a choice, and not the consequences of something we desire, we realize that it comes with costs as well, and we become more willing to accept both sides and let go, when the time comes. Instead of imagining what it would be like to choose this very moment, let’s start today. Right now choose this moment, and accept what it brings. Choice is power. Choice is awareness. Choice is freedom. Choosing this moment is the best way to live this moment and every other present moment as it comes.